Last Monday, April 6 Hollywood Boulevard saw its own version of the running of the bulls as Fox staged the world premiere of “The Longest Ride,” with professional bull riders demonstrating the sport in front of the TCL Chinese Theater. Britt Robertson didn’t seem fazed as see looked stunning, courtesy of a beautiful Dior dress and the skilled hands of Celebrity Stylist, Christian Wood. Britt’s chill “Modern Rock Goddess” ‘do is chic and perfect for Spring/Summer 2015. It’s a look that is perfect for the office, cocktails, date night or the music fest season. Sharing the full-on “how to” is TME favorite, Christian Wood who is one of the TONI&GUY US Celebrity Stylists. Inspiration: Christian was inspired by Britt’s Christian Dior dress, which featured an embellished, high neck screaming to be shown off. Create a center part. Flat iron hair at the root to remove any bumps and help create a smoother, sleeker ponytail. Using a blueberry sized amount of TONI&GUY Casual Forming Spray Gel on fingertips and smooth out any flyaways and stray hairs. Apply along the part as a hair highlighter to give the effect of super glossy hair without using tons of products. 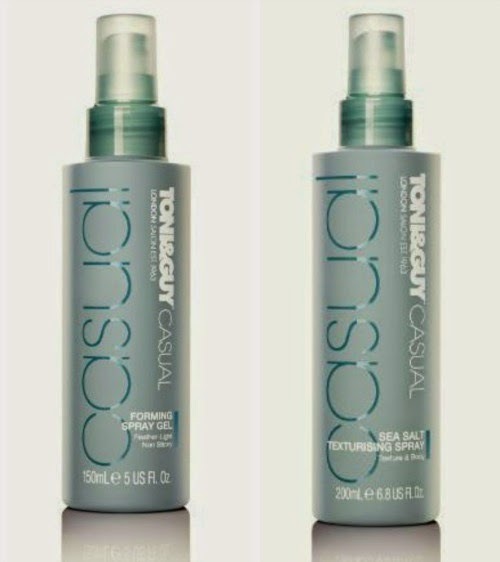 Next, spray TONI&GUY Casual Sea Salt Texturising Spray to the ponytail and let it dry to give the hair great texture and volume. Add waves to the ponytail using a medium size curling iron and alternate directions. You can find TONI&GUY products at select salons!